Paul Coulombe backs his belief in the Boothbay area as a tourist magnet by spending $30 million on his country club there. Paul Coulombe says he believes the Boothbay area should be a major tourist destination, and he’s putting a considerable amount of money where his mouth is. 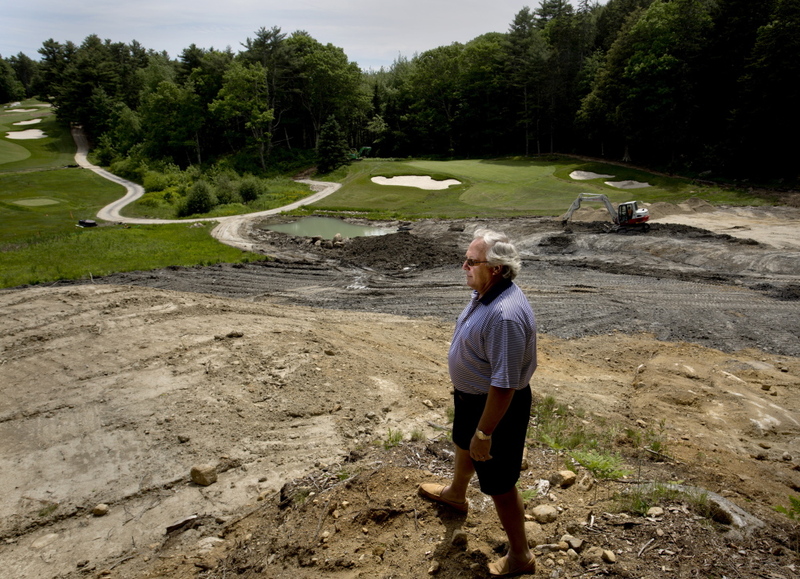 The former owner of White Rock Distilleries said he is spending $30 million of his own cash to renovate and expand Boothbay Harbor Country Club, which he purchased in early 2013 for $1.4 million. The country club had gone into foreclosure and been repossessed by the bank. 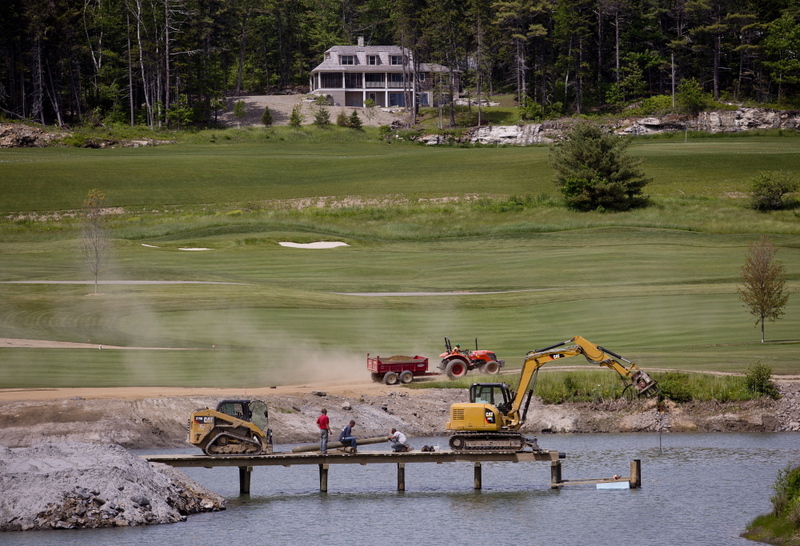 Workers build a bridge over a pond at the Boothbay Harbor Country Club on Wednesday. A “floating tee” where golfers can tee off on a tiny island will be one of many new features in the redesigned golf course. “I’m funding (the expansion) entirely by myself,” he said. About $8 million of that money is being spent on a new driving range and completely redesigned golf course, the back half of which will reopen Friday. The full 18 holes will reopen Aug. 20, Coulombe said. Bruce Hepner, who spent years working with architect Tom Doak, is doing the design. 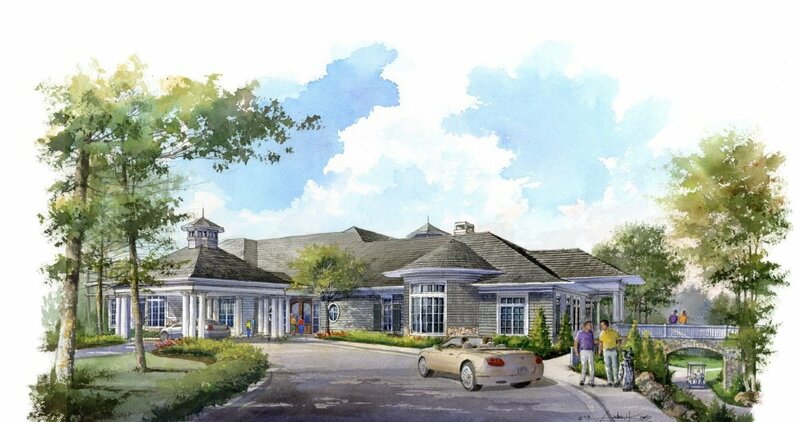 Next, Coulombe will add a second entrance to the country club and replace its modest, 2,500-square-foot clubhouse with a new one more than 10 times its size. Eventually, Coulombe said he plans to add guest cottages, a full-service spa, four tennis courts, two swimming pools and other amenities. In anticipation of those additions, Coulombe has bought up an additional 70 acres of land surrounding the original 165-acre country club. Coulombe said he doesn’t expect the new facility will turn a profit, but will provide a magnet to lure tourists to the areas and enhance the general local economy. His investments come at a time when the golf industry has been experiencing a serious decline, attributable to a relative lack of youth interest in the sport for years and the hit it took during the Great Recession. According to the National Golf Foundation, 14 new courses were built last year while another 157 closed their doors. Coulombe made his millions by growing and eventually selling Lewiston-based White Rock, producer of popular liquor brands Pinnacle Vodka and Calico Jack Rum. The buyer was Beam Inc., maker of Jim Beam bourbon, which paid about $600 million for the distillery company in 2012. Beam announced plans in early 2013 to shut down the Lewiston facility, relocate its operations to Kentucky and lay off the distillery’s 160 workers. Meanwhile, Coulombe built an 18,000-square-foot mansion on nearby Pratts Island and opened a restaurant, Oliver’s at Cozy Harbor, in the former Gus Pratt’s Store in Southport. The former liquor mogul said he would like to use his millions on further efforts to convert the Boothbay area into a world-class tourist destination, including the development of a new marina and luxury hotels. Coulombe has demonstrated his commitment to the area by supporting projects that promote tourism, such as the renovation of Boothbay Harbor’s Cuckolds Light lighthouse, said Catherine Wygant Fossett, executive director of the Boothbay Harbor Region Chamber of Commerce. “He’s a huge supporter of this region,” Wygant Fossett said. The most difficult challenge for Maine’s tourism industry is to get vacationers to visit the state for the first time, she said, and a country club like the one Coulombe envisions could be the thing that attracts some of those first-timers. “If you’re a golfer, and you see this gorgeous course, you’re going to come back,” Wygant Fossett said. Coulombe said the country club upgrade is turning to be much larger in scope than he had anticipated. To redesign and expand the existing golf course, Coulombe hired a work crew of about 75 to reshape the land by excavating some areas and building up others. The project broke ground in October. New water hazards, running streams and bridges are being built, including one that will connect to a tee box sitting on a small island. “Some holes, we’ve got 20 people working on a hole,” he said. The project requires the installation of entirely new drainage and irrigation systems, and all of the fairways and must be covered with turf. At the recommendation of a consultant, grass on the new greens is being grown from seed. In addition, 5,000 trees are being planted to separate and frame holes, and to provide a scenic backdrop, he said. “It’s a lot more (work) than I ever thought,” Coulombe said. Boothbay Harbor Country Club was established in 1921 as a nine-hole course and was expanded to 18 holes in 2000. Coulombe said the course was fun, but too short and not very challenging. The club is semiprivate; tee times before 1 p.m. are reserved for members only, but after 1 p.m. anyone can play. Until the full 18 holes reopen, only members will be allowed, Coulombe said. Memberships are $1,500 for Maine residents, $2,500 for non-residents and $3,500 for a family, he said. The country club has about 225 members. Coulombe said he would like to see that number grow to about 300, along with an increase in public play. “I want to make this the No. 1 golf course in Maine,” he said. But Coulombe said he doesn’t care whether his country club makes money. He said the expansion project’s purpose is to help raise the profile of Boothbay, and that he does not anticipate the country club ever turning a profit. “No, I don’t expect to make any of that investment back,” Coulombe said.